My old Top-Break US Revlover Co. This is a very old, and non-functioning gun. I'm sure I'm about to ruffle some feathers on this one, and that's okay because what I'm about to say is true and that's all that really matters. There are tons of myths floating around from folks and I'd like to put one of them to rest today. The myth in question, is that revolvers don't malfunction. Read my lips, er, words — that's just not true. It may not be malicious. They may just be misinformed people saying things they think to be true but aren't. Or, maybe because they've never had a malfunction with a revolver they group them all together as being the ultimate non-breaking mechanical device. Maybe not as often, but when they do break they usually have a catastrophic malfunction that cannot be fixed as you're using it or defending yourself against an attack with it. Yes, they do break less often. They have less malfunctions than a semi-auto handgun does, but they DO have them. Now, I'm not beating up on the revolver here, I do own a few of them and carry them on a semi-regular basis. I'm just trying to fix something untrue that's caught on like wildfire: the myth that revolvers never malfunction. How can I prove it to you? It's not scientific, unfortunately. Remember I've never had a revolver malfunction myself. That person asked a very serious question in the private group, and there are hundreds of comments so far. 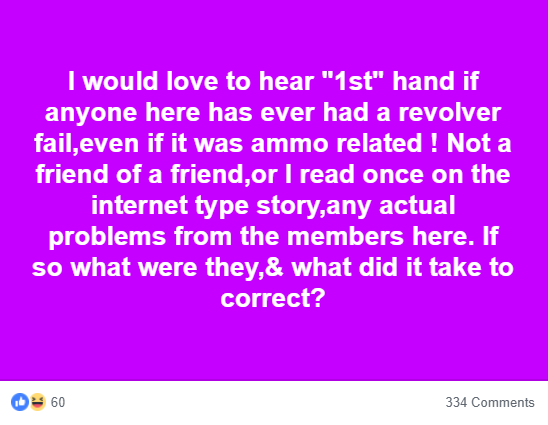 The answers ranged from people saying that they've never experienced a revolver malfunction of any kind, to people experiencing several. Please note that the following screen shots are from actual people in the group, though I have chosen to hide their identity because it took place in a private group. And, if there were a couple of themes I feel like I noticed, it's that “hammerless” revolvers seem to have more problems, in general, than their hammered brethren. It is a common myth and something I've unfortunately heard many times. This next one was a DA/SA (double action / single action) gun–a S&W 686 in 357 Mag that seemed to only want to fire single action. On one hand, at least the gun still worked. The point of all this is simple and not to pick on revolvers. Revolvers do malfunction. Maybe not as often as semi-autos, but they do fail. To say otherwise, to say that a mechanical thing won't or cannot break is false. The key with all firearms is to keep them well maintained and in tip top shape, especially if your life depends on it. The reason why I'm addressing this, is because false information can be deadly. Imagine if you will, someone new to guns buys a revolver for self-protection and one day actually has to use it. Only, for some reason it goes out of time. The person then has to stop defending himself with a dumbfounded look thinking to him or herself, but revolvers aren't supposed to malfunction. What happened? What happened is that well-intentioned people misinformed you. I mentioned above that I carry a revolver on a semi-regular basis. When I do, and for a few of my semi-autos as well, I tend to carry in a JM4 Tactical Quick Click & Carry Holster. They are definitely worth checking out. Long time ago in a place far away, I was ordered to run a requal course for members of the US military unit I was assigned to. It was 15 people using their assigned weapons, which were 3 1911’s and 12 revolvers (2 inch barrels, probably Smith 10’s but I don’t actually remember any more). During the requal shoot, one 1911 and two revolvers busted and would no longer function. Finished the course with spare weapons. Don’t recall exact malfunctions (wasn’t my problem), but not ammunition related, everybody using GI ball. Probably a matter of many years of use and indifferent maintenance (although these were our “assigned” weapons, none of us had ever seen them before, and didn’t again, for that matter. Later, in RVN, I was issued a brand new 1911 which I actually carried all the time, and shot, discovering in the process that the brand new extractor had very sharp edges which would hang up on cartridge rims and cause failure to feed. A file fixed that. But what I learned from all that was to always test anything you are going to depend upon, and know it inside and out. Great article! I make sure that my firearms are clean always just gives me more confidence and I always practice at home to get familiar with the firearm before I go to the range.Kudos to you thanx!! You say you’ve never had a “mechanical” revolver fail. So, what other non-mechanical designs of revolver handguns have you shot? Hey Sam, I think you’re reading too far into what I said. I’m not saying I’ve shot other types of revolvers, just that there are other types of malfunctions. Ammo and operator error to name a couple. Thanks for the comment. Wow, I’m glad everything worked out good for you. Had a Charter Arms 38 Special break the part that slides the part up between hammer and firing pin. Would not fire. Still under warranty. Sent in and they returned it fixed. Only had about 150 rounds through it. A nice gun for a backup, but sold it shortly afterwards, not trusting it. I have a Charter and love it. But, any gun can break. Thank you for sharing your experience. Of course, revolvers fail. I’ve had a firing pin tip break off, a pivot stud for a hammer break, and various springs fail/weaken. I have heard that if you shoot .357 +P in a S&W model 19, it can crack the frame. I have one of those guns, and I only shoot .38 special in it just to be sure. Anyone who thinks revolvers are more robust and simpler than semi-autos has never disassembled one to do a spring replacement or trigger job. Cylinder timing and alignment, hammer spring and trigger-return spring pressures, cylinder gap clearance, hand and pawl wear are all potential failure points. Long ago, brother and I had a Colt that was worn with bad timing. It fired only when hammer-cocked. Fixed by ‘smith. In the last decade, Taurus 85 locked up and wouldn’t release the cylinder. More recently, the firing pin broke (same gun). ‘Smith fixed both. Revolvers are a mechanical device and any mechanical device is subject to issues of a mechanical failure nature. Compared to the myriad of issues that can plague semi autos, revolvers are considered to be more reliable. Maintenance and regular cleaning care can greatly reduce failure and function issues in any firearm. I personally own S&W, Ruger, Colt and Taurus revolvers, S&W, Sig Sauer, Ruger, Beretta, Browning, Glock, SCCY and Walther semi autos. I have shot competitively since the early 60s and have had only one S&W revolver actually breakdown, it happened in practice for a short gun match, a Chief Special that locked up on double action. I boxed it up and sent it to the factory for repairs, that same 5 shot still works perfectly. I wish I could say the same for some of the semi autos I have owned over the years. 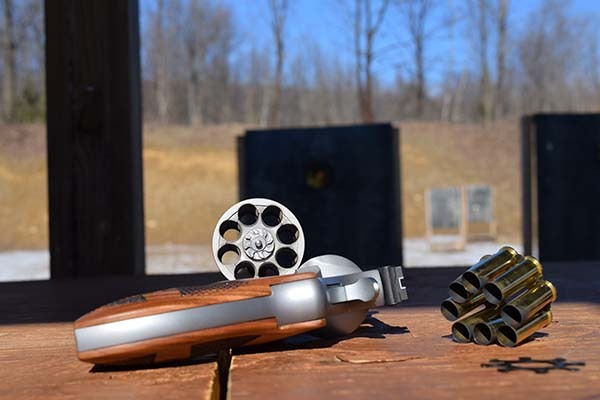 Depending on the type of ammo your using revolvers will tolerate a lot more rounds through them than most semi autos before a good cleaning is required. Much of the powder residue in a revolver is expelled from the head space while it’s pretty much contained internally within a semi auto.